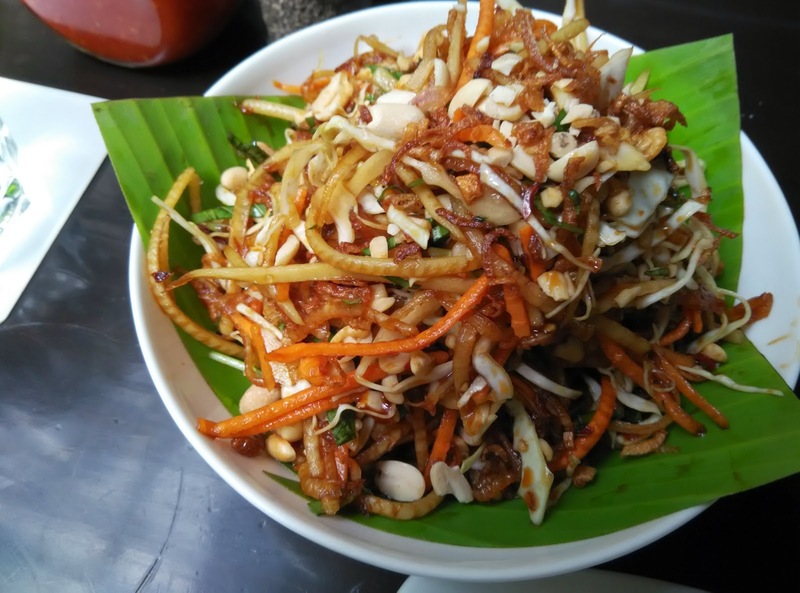 I've always been intending to write about Bangalore's lesser known, yet best 10 food items (in my opinion) that are a must try for every self-proclaimed / genuine foodie ! While my list is obviously a vegetarian selection spanning over starters/mains/desserts, some of them do have a non-veg counterpart as well. Care has been taken to predominantly list the affordable and wallet friendly dishes. Read on to know more about what they are, how they taste and where you could get them. 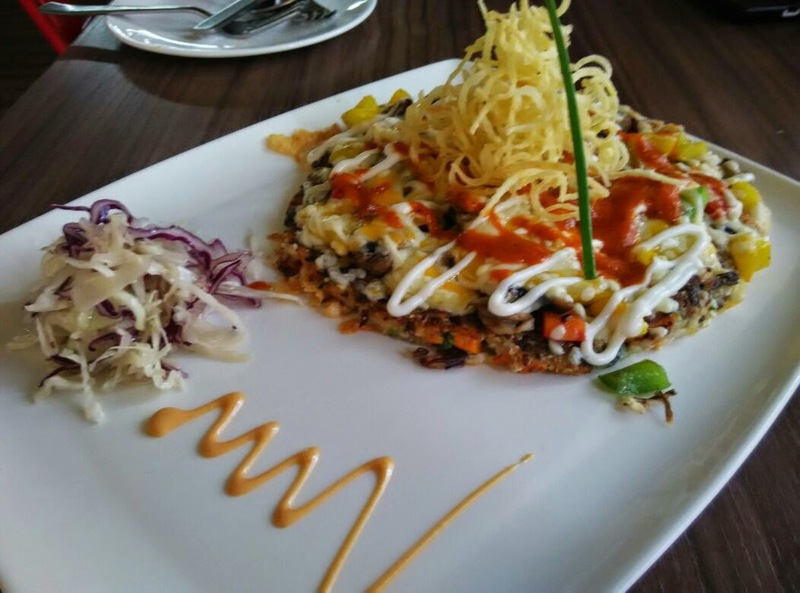 While the name "Okonomiyaki" is intriguing enough, the dish is an absolute winner. There are two variants for vegetarians, and a few more for non-vegetarians. I chanced trying the "Cajun spiced bell peppers with Mushrooms" while there is another "Potato with Jalapenos and blended cheese". The one I tried was bliss at every bite. The spice of the cajun peppers, the texture from the mushrooms and the blend of cheese and barbecue sauce perfectly came together in a beautiful pancake, topped with some really delicious crisps which further added texture to the dish. Tip - Avoid weekends, as it gets a bit crowded, and they don't take reservations. If you do need to go on a weekend, chose odd hours. What - A classic variety of authentic Italian Pizza is Sicilia Pizza. Where - The Pizzeria, Kasturi Nagar (Banaswadi) / Kalyan Nagar / Marathahalli / Frazer Town / JP Nagar. This is clearly a mini cafe and cannot host more than 6 people at once. However the taste of the food, and the home delivery facility makes up for it all. Sicilia Pizza is by far one of the best thin crust, affordable pizzas I've had in Bangalore, and can surely give the pricey counterparts a run for their business. Though Sicilia is a vegetarian Pizza, the place has a bunch of non-veggie pizzas as well, that are probably worth trying. Unfortunately, the brand is yet to market themselves better ! Tip - Appetize yourself with their interesting "Masala Garlic Bread", before the Pizza arrives. What - Two pastas with almost similar sauces - One being Spaghetti and the other being Penne. 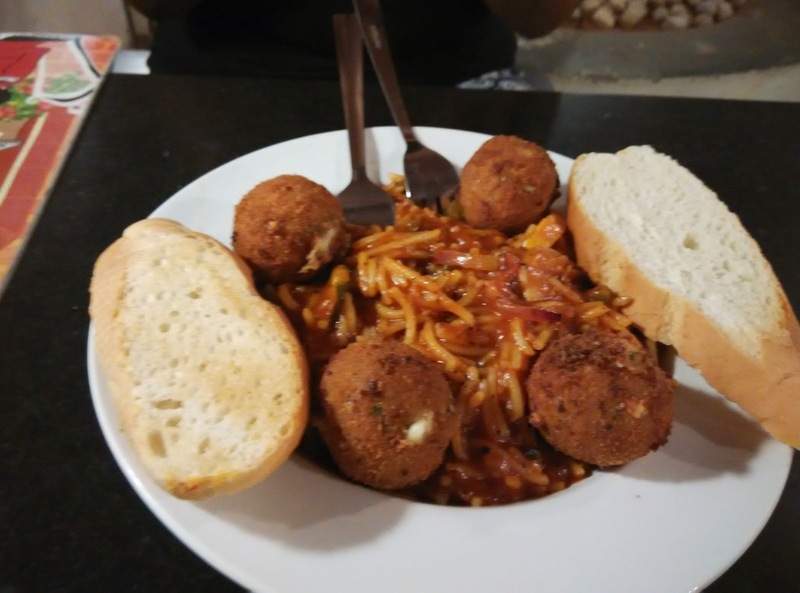 The difference being that the spaghetti version is topped with mozzarella cheese balls, while the Penne version is slightly sweetened. Just when I went about proclaiming that Basil Pesto Pasta was my "favouritest" thing in the whole wide world, I happened to try Exotica Shmetzotic which just changed my perception entirely. A beautiful combination of tomato and pesto sauces, this Pasta is a perfect culmination of various ingredients and flavors. I prefer a spicy version, and hence request them to make it to my taste. Again, I thought this was the "bestest" thing until I tried the Spaghetti with Golden Globes. Essentially the same (or so, I thought) the tomato and pesto sauces come together in strands of spaghetti, but the highlight is the Golden Globes, or Mozzarella cheese balls that add the perfect balance to the saucy mix. Both these pastas are a sure shot way to Indo-Italian bliss, an interesting journey away from the Arabiatta/Alfredo/Pesto sauces. Tip - The lemon grass tea here alongside the pasta is a combination made in heaven. What - Stone Cold Ice creams , which are made by mixing and beating up a variety of flavours and ingredients to give a single flavorsome entity. Price - Rs. 150 as I knew it last. The owner was mentioning about increments in the price list shortly. For the health freaks who always prefer a salad to a starter, Oak Ash Chevre is a delectable delicacy worth trying. 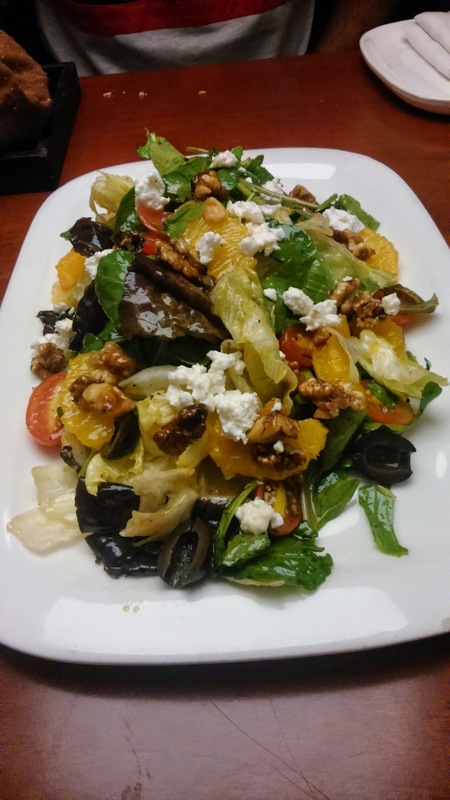 While the usual "ghaas-poos" (aka leaves) make up only 50% of the composition, the addition of roasted walnuts, feta cheese, cherry tomatoes, olives and Californian Oranges are what does the trick. Each of these bring a distinct flavor and texture and they are beautifully fused with the Passion Fruit emulsion that binds them all. A tad bit expensive, but a different kind of salad absolutely worth trying. 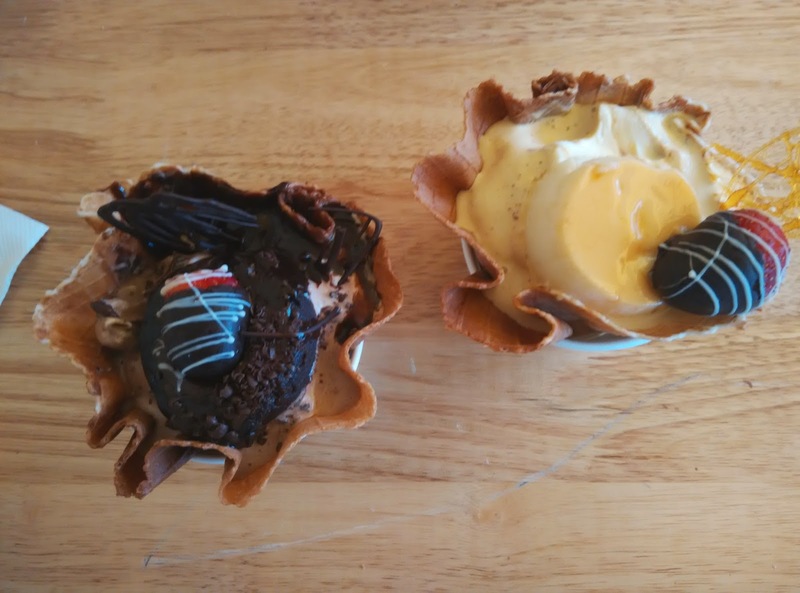 Tip - Do try the Philly Cheese cake and the Hazelnut Mousse Flan desserts while you're here. You'll never be able to forget the meal (and its cost as well). What - We all know it, but just because I like defining food items , Nachos are corn tortillas/chips served with with Mexican toppings - Beans, cheese etc. 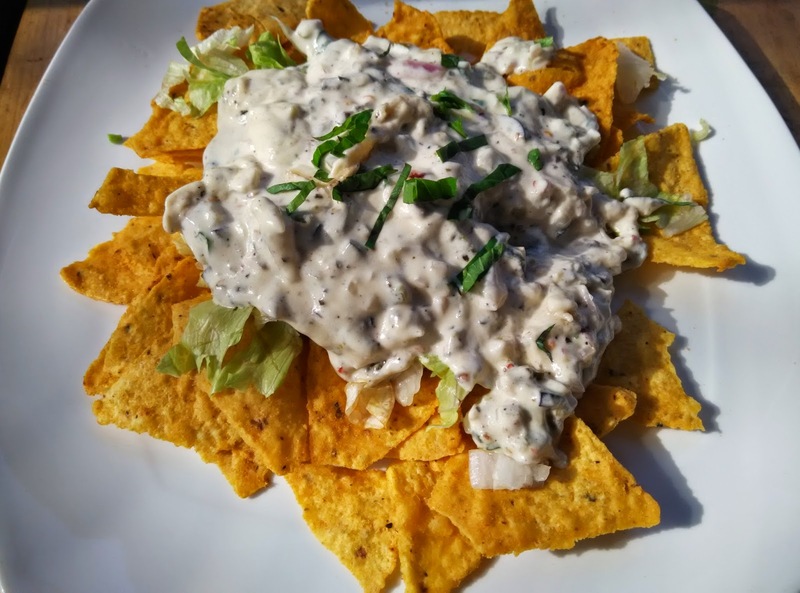 Nachos are everywhere and are finger foods one cannot go wrong with. So what's special about the ones here ? In most places, the tortillas are topped off with the basic ingredients, but all of these appear as individual entities. In Cup O' Joe, however, a uniquely tossed sauce, where cheese, sour cream, jalapeno, lettuce and olives all come together is used to top the tortillas. This consolidated sauce is what does the trick. And some magic in the kitchen probably ? 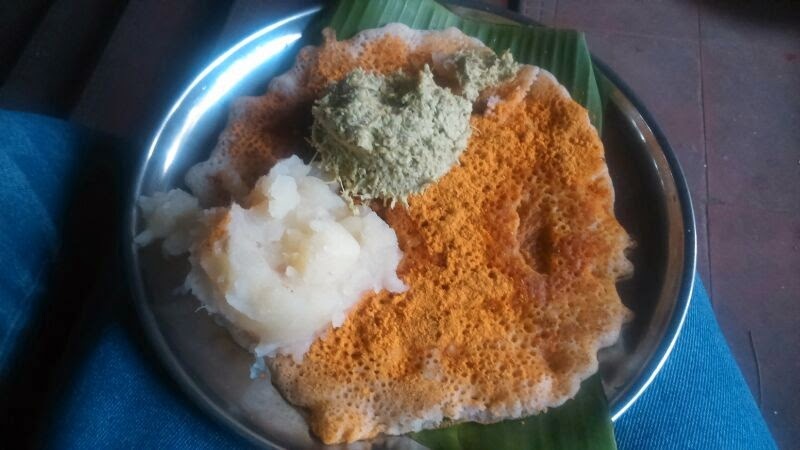 What - A specialty from Davangere district of Karnataka, this Butter Masala Dosa is served open, and sprinkled with spicy Chutney Powder. For the Masala Dosa lovers, this one is a must try. I can't think of a better Dosa I've had, barring the authentic one at Davangere itself. This is a close second. Served with thick chutney and soft white mashed potato (devoid of the turmeric and other ingredients), Open Dosa will definitely get you drooling for more. Tip - This is on the lines of a roadside eating joint. One might get a seat in the small basement seating area that they have, but if not lucky enough, they will need to stand outside the stall. What - There's a reason I chose to mention the name of the stall, and not the specific tea available here. Where - Sharon Tea Stall , Opposite NH8 Restaurant, Tippasandra Main Road. Every tea available here is a masterpiece. I've often wondered how they serve such classy teas, not compromising on the quality, yet maintaining the costs despite being just a roadside stall. This can be easily missed, so I urge you to look out for it with a keen eye. I would prefer going to Sharon Tea stall for my perfectly brewed cup of tea, over any other fancy Tea Room or Tea store. They have almost a hundred varieties on the display board menu, spanning over tea, coffee and milk as well. My top favorites are - Ginger Tea, Ginger Elaichi Tea and the Pepper Tea in the milk variety. Black currant tea is a Must Try in the non milk set. This is one place to watch out for when you're around Indiranagar. Price - Between Rs. 10 to Rs. 20 per glass. Tip - Do not forget to try their Benne Biscuit (Butter biscuit) served warm from their oven. It is slightly salted (providing a perfect accompaniment to your tea) and literally melts in your mouth. This is one discovery I will be thankful for. It does the simple job of satisfying Mexican cravings in a small bowl, while simultaneously satisfying the Chaat cravings as well. The Puri (of Masala Puri) is replaced by Nachos, Green Peas by Red Beans and Indian Masala by a tomato based Mexican Masala and finally topped with a layer of cheese. Tip - Closed on Sundays. Another low-fat delight, this Raw Papaya salad is not what you usually find on buffets in the salad section. This is an authentic south east Asian version, with a good amount of varied spices that bring about a burst of flavors in your palate. Truly one of the best Salads in Bangalore. Tip - While you're here, do try out the Mung Bean Pudding for dessert. A well plated moderately sweet delicacy made of Mung beans and sticky rice, garnished with litchis, strawberries and green apple. What - Another Karnataka relish popularly known as Mangalore Bajji. A Mess, well known to the folks on the road, but lesser known to the rest of the town, this place offers what I believe is the best Mysore Bajji I've ever had. Perfectly crisp fried to a wonderful golden-brown, these make a great breakfast, or a snack immediately after breakfast. The Chutneys at this shop are to die for. To be tasted to be believed. Tip - If you are a hygiene freak, that cannot step into a stall even 1% short of "Pristine Clean" on the outside, this place is probably not for you ! What - Custom made crepe, loaded with all kinds of chocolate sauces. And finally, this is one dessert I can never ever forget for a long time to come. Although a custom made one, you could try telling the Chef there to prepare something on these lines if you happen to visit. 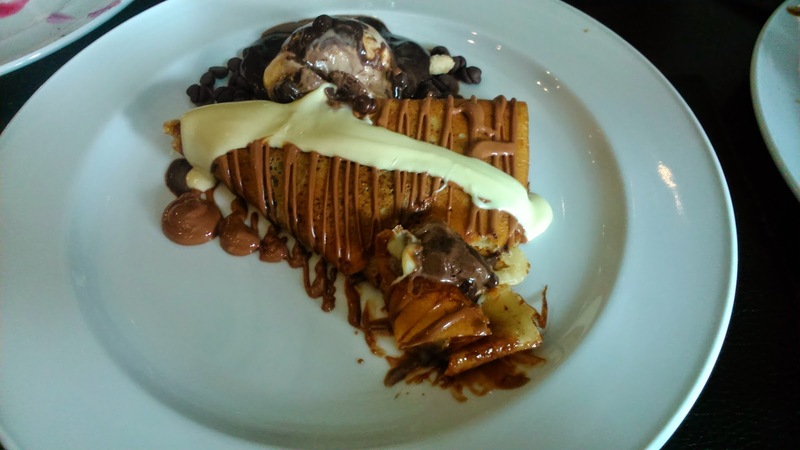 Soft crepe filled with Nutella, drizzled with chocolate sauce, topped with a dollop of white chocolate, served with chocolate Ice Cream and garnished with Chocolate chips. Too much chocolate ? This is well and truly Death by Chocolate, a death you will not regret ever. Sadly I'm not certain if you can walk in just for this dessert, since I had the chance to try this from the dessert section of a full buffet. But I wouldn't mind going for the buffet just to get a taste of this again. The rest of the buffet is indeed a treat worthy of royalty. What are you waiting for ? Go NOW and get your dose of sin :) It can't be simpler than this !